Sweet, firm medallions of crayfish or lobster meat work fantastically well with Asian flavours. The creamy coconut dressing is thickened with ground rice and sharpened by some lime and salty fish sauce. Piled high with soft herb leaves, it makes a fabulous starter or an indulgent lunch dish. If using rock lobster tails, place them in a pan of simmering water and cook for 8–10 minutes until the flesh turns opaque. Take out, cool, lay on their backs and cut down the centre into halves. Whether you’re using rock lobster or Nova Scotia lobster tails, remove the flesh, discarding the shells, and cut into 1cm thick slices. Blanch the asparagus in a saucepan of lightly salted boiling water for 5 minutes until bright green and tender but crisp. Refresh under cold running water and drain well. Mix the ground rice with 1 tbsp of the coconut milk. Heat the remaining coconut milk in a small saucepan. Stir in the ground rice mixture and cook until slightly thickened. Add the sugar, fish sauce, lime juice and chilli and cook for 1 minute longer. Place the asparagus, lobster and herbs in a large bowl and gently toss to combine. Pile onto a serving platter, drizzle over the dressing and sprinkle with the mint, coriander and kaffir lime. 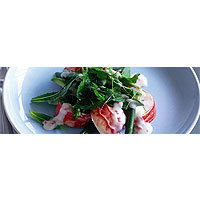 The richness of the lobster and the oiliness of the dressing is too much for a conventionally crisp dry white, so go with a round, scented, low-acid white that works with, rather than against, the unctuous flavours in the salad.